Alan is as passionate for architecture and design as he is for dancing. Having spent years in New York and London serving renowned firms such as Rafael Viñoly and Benoy, Alan was shortlisted for the Young Architect Award by Hong Kong Institute of Architects in 2015 and has been awarded as“40 Under 40” in the Architecture category by Perspective in 2018. An ‘aestheticist’ at heart, Alan also co-founded A.Style Art & Furniture Store. What’s more, Alan loves enjoys chilling out with his clients as much as he loves furniture shopping. Upbringing in Hong Kong and London shaped Sarah into a ‘Glocalist’ who enjoys adding sense of humour and cultural twists to everything she designs. When she is not laughing with the One Bite team and her students, this winner of the Hong Kong Young Architect Award 2015 is probably doodling the next rhapsodic, city-hacking plan. She recently received the DFA Hong Kong Young Design Talent Award, and the Certificate of Commendation by the Secretary for Home Affairs of the Hong Kong SAR Government in 2018. Years studying at the Bartlett School of Planning, University College London, not only shaped Billy’s professionalism in urban planning, but also his (in)famous love for craft beers and whiskey. 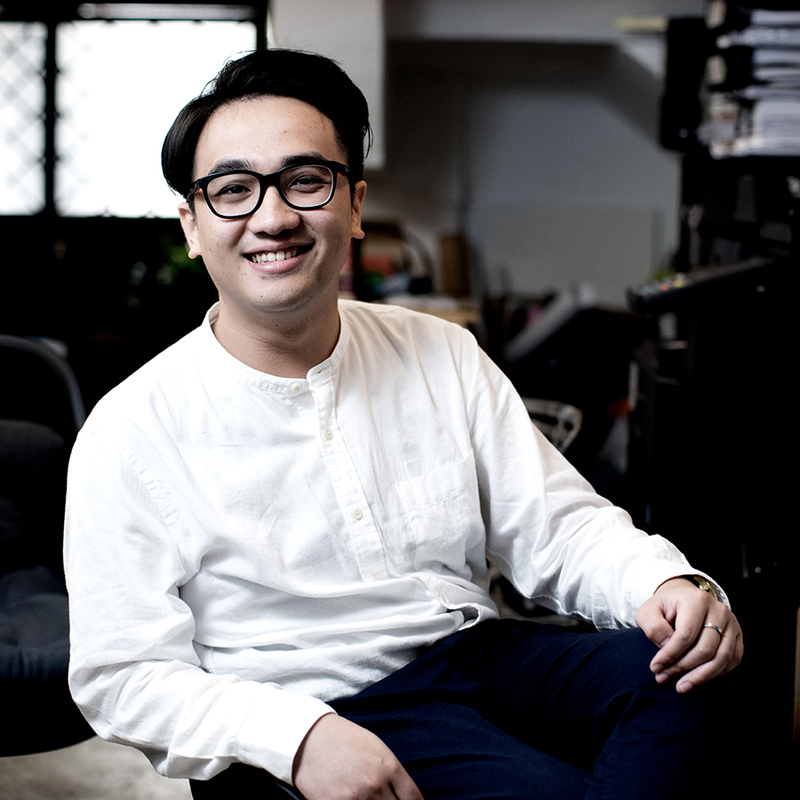 This winner of Perspective’s 40 Under 40 Award – Architecture 2014, when sober, is an expert in curating community events and social creative programme; and he was previously a founding member and curator of Very Hong Kong, which is recognised for creatively transforming public space with pop-up community events. Trained in Australia as an architect, Lung handles all intertwining processes of a project as if he was preparing a Thanksgiving feast. Though allergic to octopus, Lung is the best chef in the team, or even probably the friendliest one. Having plied his trade in Singapore, Korea and the Philippines, Tony brings to the studio unique work experiences from these regions. This Indonesian-born, Singapore-registered Architect fell in love with Hong Kong Dim Sum at first bite. Besides 'Yum Cha', he loves backpacking the world, sketching, running Marathons and hiking. For one mountain a week keeps the doctor away. Graduate of the University of Lincoln, the UK, Suet is a cheerful but tireless lady. Her acute observation and energetic character never fails to impress every client. Suet is our bakery queen, who masters all related programmes and events. Graduated from Newcastle University U.K., Luana is always intrigued by wood work and model making at every stage of the design process. Dedicated and hardworking, this outgoing lady is always keen for outdoor activities and making handcrafted gifts for people around her! Trained as a graphic designer and spending a lot of time in the art scene, Chloe is good at engaging audience with creative events. She is also our healthy living guru that could probably give you a free meditation class with dietary advice when you are stressed! Growing up in Malaysia and Hong Kong, Sherene masters four different languages and is a scholarship recipient from the University of Hong Kong. Culturally competent, she is friends with everyone and is an all-rounded designer who supports both our Hong Kong and Singapore studio. Formally trained as an economist, Tony is a self-taught 3D artist specialising in digital visualization. Originally hailing from Canada, Tony loves local Hong Kong culture and enjoys spending time building 3D rhino models, be a Victorian building or a tram! Graduated from the Bartlett School of Architecture in London and Columbia University in New York, Melody has translated her daily life at these two great world cities into an interesting array of Instagram photos and urban sketches. You may call her an urbanite! Dora is probably the Madam Know-it-All at the office, who takes care of our daily operation, as well as well-being! When she is not showing off her exceptional multitasking skills, she is very probably challenges new recipes. Also known as "Hinjai", as his nickname may suggest, he is the youngest design talent in our team. Yet he scored the top award back in University of Lincoln with a nomination of Bronze Medal from Royal Institute of British Architects with his eclectic design based on a maze from a movie scene. This communications design graduate from New York’s Syracuse University just never stops exploring ways to turn her graphic design skills to meaningful work. Wonder how graphic designer breathes life into your brand? Consult this expert. Chee Yee believes he was born to be an artist, and of course he is. The all-round designer is fascinated and prominent at different kinds of design, from illustration to websites and apps, from origami to 3D modelling. Suki is passionate about the power of partnerships - especially between the business and voluntary sector. A strong communicator and relationship manager, Suki has extensive experience in fundraising, marketing and communications in both Not-for-Profit and Corporate sectors. Her main interest is to engage the community in conversations about some of the most pressing social issues. Jessica has a background in Landscape Architecture and has always been passionate about developing innovative and creative public realm projects. An avid swimmer and a passionate hiker, she injects energy and lots of positivity to the One Bite team. Our 24/7 commander George may seem interested in only tuna treats and naps, but his intuition towards spatial arrangement and materiality is so incisive that he must review all projects before every meeting. You may call him Boris/Ball/Ah Ball/Ball Ball, he was invited to join our team from the rough streets of Sheung Wan. As soon as we have discovered his creative talents, we waste no time in assigning him with the best mentor in town. Who is his mentor? George the Cat Manager.